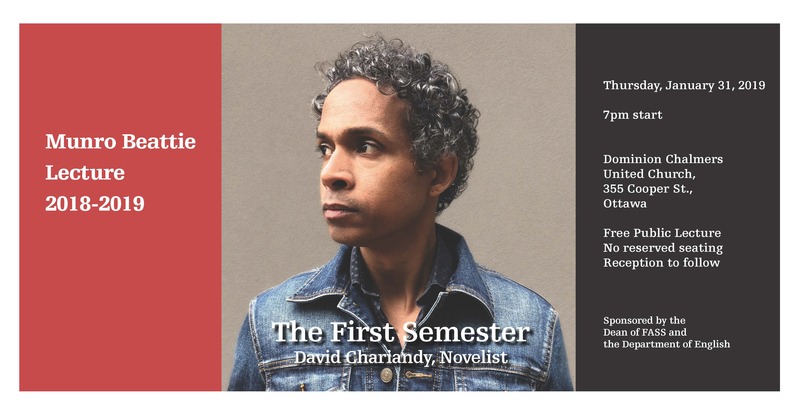 The Dean of FASS and the Department of English are delighted to announce that the 2018-2019 Munro Beattie Lecture will be delivered by acclaimed novelist David Chariandy. Taking the bus from Carleton to the Munro Beattie lecture? You are welcome to join a group of students and professors who will meet in Residence Commons before 6 pm and walk to the OC Transpo bus stop to catch the #7 Bus (departing 6:05 or next available time). Alight at Somerset Street for Dominion Chalmers United Church, 355 Cooper St.